Battle of Long Sault NOTE: The book is getting a slightly new title and a new cover while it is in final edit before publication on Amazon and elsewhere. 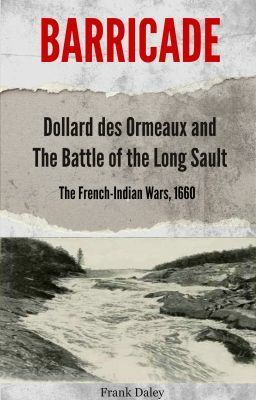 It will be entitled BARRICADE Dollard des Ormeaux and the Battle of the Long Sault The Battle of Long Sault occurred over a five-day period in early May, 1660 during the French-Indian wars. It was fought between French colonial militia, with their Huron and Algonquin allies, against the Iroquois Confederacy. The battle took place along the Ottawa River in Canada at a series of rapids known as Long Sault. (Sault is an ancient French word for rapid(s).) A force of 17 Frenchmen and about 40 Indian allies under the command of Adam Dollard des Ormeaux went up the Ottawa river to ambush marauding Iroquois on the river as the Iroquois had been doing to the French for years. He was joined by 40 Indian allies, Huron and Alqonquin, but as they prepared to camp at the bade of the rapid, two Iroquois war canoes came slicing over the rocks. The fight began and they did well for time because they had more guns than the Iroquois and were better shots. But the odds and the battle's outcome came into doubt as 200 Iroquois reinforcements arrived down the sluicing waters. The French could not reach their canoes, which the enemy burned. They were running out of water, food and ammunition. Then, things got worse. Think the Canadian Alamo. This is not a love story.